As she struts up and down the imaginary aircraft cabin on the stage of Arena’s Kogod Cradle, Franny Potts (Ann Randolph) achieves a level of adorkable that dates back before Zooey Deschanel put on a pair of plastic frames. I’m not talking about today’s awkward yet cute look, I’m talking about an unfiltered mouth passionately spouting out factoids about America’s National Parks. I’m talking about a mouthful of adult braces and the lisp it causes. I’m talking about proudly and unabashedly being a dork because you love it and you don’t care what everybody else thinks. Loveland is a semi-autobiographical tale of humor, love, and loss. 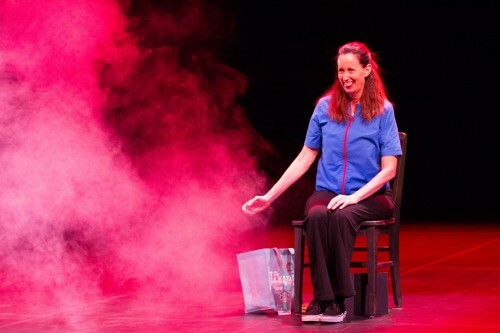 In this one-act, one-woman play, Randolph is awkwardly hilarious, occasionally endearing, and is very comfortable in her pair of stretchy pants. The bulk of the show takes place on a cross-country flight where Franny is traveling to her hometown of Loveland, OH. A series of asides and flashbacks introduce a variety of other characters including Franny’s mother, a chain-smoking tour-de-force who is the source of Franny’s no-holds-bar attitude. No topic is taboo for Potts, who openly opines over a possible soul mate in the flight’s Pilot and hilariously illustrates awkward situations when her sexual urges clash with her Yoga class or shopping trips to Whole Foods. A masterful storyteller, Randolph finds a good balance between awkward humor and poignant and cathartic moments. Loveland is full of bite-sized moments that you will eat right up. The show’s theme of love and loss resonates with audiences to the point that Randolph offers post-show talkbacks to allow them to share their own experiences. As a short piece it gets the job done and as Randolph delightfully and sometimes painstakingly shares her experiences, it is a simply a solid piece of theatre. Loveland performs at Arena Stage’s Kogod Cradle now through April 13th, 2014. Arena Stage is located at 1101 6th St SW, Washington DC 20024. Tickets start $25. For more information, call 202-554-9066.